I don't like to write a book review too harshly, especially when it is written by an author I like. It's why I've hesitated, several times, in writing this review. I do believe in being honest with my opinions, though, even when it makes me uncomfortable to do so. All that being said, I tried to love The Lying Game by Ruth Ware. I swear I tried. I enjoyed her other novels In a Dark, Dark Wood and The Woman in Cabin 10. 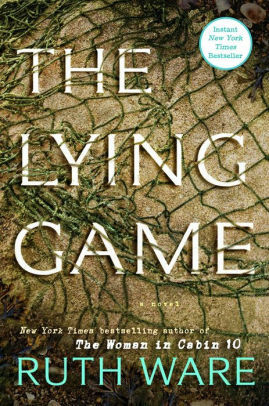 I was looking forward to The Lying Game, and I am the one who suggested it as a book club read. But, try as I might, I found myself a bit annoyed with the novel...and, thus, a bit annoyed with the author. Please allow me to explain. I am a patient reader and not quick to judge until I've read an entire novel. Even then, I'm not quick to critique. I like to 'mull over' the story for awhile. I'm also used to novels dragging at some point, or the details becoming a bit more than I prefer, but I take that in stride. I can even break out what I don't like and set it aside to consider the rest of the novel. In other words, to use an old idiom, "I don't throw out the baby with the bath water" when it comes to novels. For example, I love The Name of the Wind by Patrick Rothfuss. For me, it is one of the most well-written novels I've ever experienced. I fell more in love with the art of writing from that novel that anything else I've ever read. However, when he wrote the next novel in the series, The Wise Man's Fear, I felt he jumped the track a bit. I saw where it could've been better. It was, once again, a fabulous novel,...but I would have taken out about 75 pages that really didn't need to be in there. Now, there could be a reason for those extraneous pages, and it may reveal itself in some kind of 'tie in' to the third novel, buuuuut...by then no one cares. Including me. And, again (for the record), I think Rothfuss' writing is genius,...but no one is perfect. At its core, when you strip away the unnecessary parts that bog down the tale, it's a good story. But as I read, I felt like Ware had a book contract with a 'minimum pages required' clause. There are elaborate descriptions that go on too long, but that wouldn't be so bad if they weren't repeated over and over again. By the end of the novel, I could perfectly describe Thea's legs, Fatima's hair and hijab, Kate's flat stomach, how a grown woman feels like a 16-year-old hormonal teenager, how a baby smells and coos and cries and smiles, and how to breastfeed. Now, if those were the only problems with the novel, I might not complain...too much. I would have just skimmed the repetitious parts. Sadly, those are not the only problems. The narrator, Isa, is ridiculous. Now, to me, this is not the same thing as being "an unreliable narrator," as I enjoy those types of novels. Isa's thoughts are ridiculous, yes, but that's believable because we all have absurd thoughts sometimes. It is how her actions play out that I found myself shaking my head again and again at how the author expected me to believe this is how a human being would behave, especially one as obsessed with her baby as Isa seems to be. It's just not believable. And, in realistic fiction, I should believe it. For me, it was distracting how unbelievable some of the novel's scenes played out. I found myself just wanting to "get through" the novel, and I didn't care about the characters anymore. And that's never a good sign. Will I ever read another Ruth Ware novel? Yes, of course, I will. And while some people may not agree with this review, I have to wonder if they read her other novels. By comparison, the first two were much better. Even Goodreads reviewers show the other two rank higher in star ratings. I'm going to mark it up as a 'life happens and writers aren't perfect' and hope Ware's next novel will be better. I believe in second chances. If the next one, though, disappoints me, I won't be trying again. One 'off' novel, I understand. I just hope there isn't another 'off' one after this. I'm good for two tries,...but not three. Life is too short, and my precious reading time is even shorter.